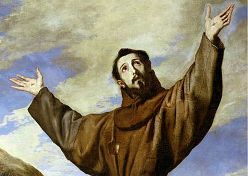 October 4th is observed as Saint Francis feast day. It is said that he received the stigmata two years before he died. This was the wounds of Christ from the cross including his hands, feet, and side. Francis traveled to the Holy Lands during the Crusades hoping to conquer the Muslims with love rather than war. Francis set up the first known Nativity scene to celebrate Christmas in 1220. He believed that actions were the best example, telling his followers to "Preach the Gospel at all times and when necessary use words."